The following article shows you how add new job board subscriptions to your idibu v2 account. 1. On the left-hand menu, under 'Configuration' click the 'Job boards & quotas' tab. 4. IMPORTANT - Read the 'Configuration Help' box carefully! Does your job board require different login information, i.e 'API' keys, or special credentials used to post via third-party systems like idibu? Do you need to call the board and advise you are posting via idibu first? This process can take a little time, but configuring your job boards correctly is essential to posting ads successfully. The Configuration Help box will tell you all you need to know about that specific posting destination. 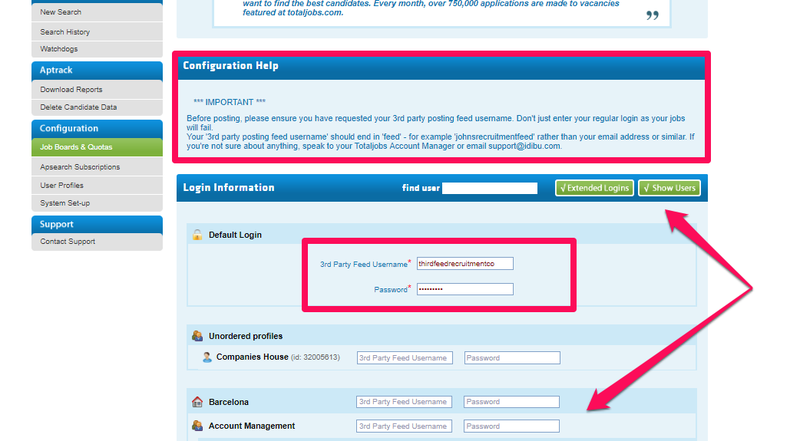 a) Add your Job Board details to the 'Default Login' fields. This will assign your Job Board account to the whole company - i.e all idibu users will post using the same credentials. b) You set up different job board details on an 'Office', 'Team' or 'User' basis. This is helpful if you have multiple (perhaps branded) job board accounts, OR, if different idibu users need to post to different board accounts. If you wish to control posting volumes too, then don't forget to set up your posting quotas..!